This unique blend of Food-Grown vitamins, minerals, amino acids and herbs has been formulated to support the body`s own production of important neurotransmitters involved in mood, cognitive and behavioural health. To support all aspects of cognitive health and to promote times when cognitive demand is high such as anxiety. With amino acids to support neurotransmitters and methylation. With molybdenum for its relationship with iron and irons relationship to serotonin and dopamine output. With Milk Thistle for its `cooling` and traditional support for routes of elimination. Mineral enhanced Lactobacillus bulgaricus (providing: Magnesium, Zinc, GTF Chromium, Iron, Molybdenum and Selenium), Vegetable cellulose (capsule shell), Nutrient enhanced yeast (providing: Methionine), N-acetyl cysteine, Beta carotene incorporated into carrot pulp, Vitamin C incorporated into citrus pulp, Renatured yeast protein, Alpha lipoic acid, Organic Milk Thistle powder, Vitamin E incorporated into Yellow pea, Vitamin enhanced yeast (providing: Folic acid, Vitamin B6 and Vitamin 12). 3 capsules per day with or without food. Capsules can be opened and added to any food or drink that is not hot. 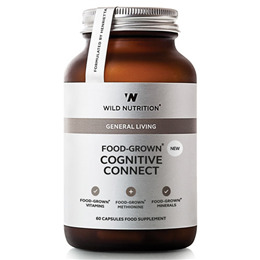 Below are reviews of Wild Nutrition Food-Grown Cognitive Connect - 90 Caps by bodykind customers. If you have tried this product we'd love to hear what you think so please leave a review. This unique blend of Food-Grown vitamins, minerals, amino acids and herbs has been formulated to support the body`s own production of important neurotransmitters involved in mood, cognitive and behavioural health.